Finally – the dust has settled on the long winded, exasperatingly drawn out ’war’ between the rival digital formats of Blu-Ray and HD-DVD, and it’s all aboard the Blu-Ray express for manufacturers and studios alike who waited on the sidelines, while the marketing men of both formats pushed and hyped the benefits of their prospective camps onto consumers. The winner may well have been decided by the odd financial incentive thrown in for a little extra persuasion, but at least there is now a winner – Hu-ray for Blu-Ray – which has the challenge of battling hi-rez downloads for our affections in the not too distant future. Of course, Dagogo is a site dedicated to high quality audio reproduction, so strictly speaking this war of what are primarily video formats is of limited interest, but when uncompressed audio is included in both formats we have a viable alternative, or more likely a complimentary format, to multi-channel SACD and DVD-A for many with the requisite systems. But I digress, as the reason I bring up this latest chapter in the evolution of digital replay is by way of taking you back in time to the birth of digital and an early divergence of two ’sub’ formats which didn’t receive much coverage, but was perhaps more relevant from the audio enthusiast’s point of view. Specifically, in 1989 we saw the introduction of the first Bitstream DAC by Philips (DAC3). Although intended for use in cheaper players due to far lower manufacturing costs than the standard Multibit chips, they were rapidly adopted across the board when it was believed that low-level detail, so highly regarded by audiophiles, was apparently improved over traditional Multibit chips. Had it not been for Philips being caught on the back foot when designing the very first Multibit chips, Bitstream might never have reared its head as the Philips engineers had to get their own heads together and do some serious chin scratching, when what they had assumed was a 14-bit word length standard was replaced with a 16-bit one after Sony became involved. Here’s a little problem, then. You’ve designed a very nice 14-bit chip, but at the eleventh hour – autumn 1982 in this case – you need 16-bit resolution. If Homer Simpson was a Philips engineer, this would have been a definite “DOH!” moment. The solution was an ingenious combination of over-sampling and noise-shaping which deserves far more attention than I’m going to give it here. Suffice to say that it was this technology taken to its logical extreme which eventually gave rise to Bitstream, and later in the day, DSD. Now, I did say that Bitstream was adopted across the board, and of course if Philips could produce chips which were much cheaper to manufacture and were even regarded by many as being better than Multibit (well, they’re newer so must be better right?) then why should I even bother bringing the subject up? For instance, Bitstream DACs usually required just one power supply while the TDA1541 required around three, so surely Multibit should have been consigned to the waste bin of digital technology? A big clue as to why Multibit survived is that when Marantz’s Ken Ishiwata designed his ultimate statement CD player, he didn’t use Bitstream technology, instead preferring the first 16-bit chips Philips manufactured three years after those compromised 14-bit TDA1540s. These 16-bit chips were designated TDA1541As and were graded for linearity with the very best being assigned the now-legendary S2 ‘double crown’ status, used only in a handful of early flagship players – primarily from Philips and Marantz – before being stashed away and once again unleashed onto an appreciative audiophile market by Mr Ishiwata. Basically, he and many other enthusiasts were of the belief that Multibit was technically superior to and inherently more ’musical’ and involving than Bitstream. The subsequent reviews of the TDA1541A S2 double crown Marantz CD7 did seem to validate this belief for virtually every reviewer fortunate enough to have this player pass through his hands. The CD7 possessed a highly resolving, up tempo, expansive presentation which seemed to combine the best qualities of other competitors at the time, such as Wadia, Linn, Naim, Krell and Levinson which ALL retained Multibit chips in their flagship products, though not, of course, the rare double crown TDA1541 S2s. That’s not to say that a well implemented Bitstream DAC can’t sound better than a less well implemented Multibit, of course, but in general, Multibit was – and I’d argue still is – King of the digital hill. You’ll by now have realised that the introduction you’ve just ploughed through must of course be relevant to the AMR CD-77, and indeed, the only chips I usually get excited about are served up with battered fish and lashings of salt & vinegar in the UK, but Thorsten Loesch of AMR has been an admirer of the Philips TDA1541 Multibit chip since before I even knew of its existence. Being an enthusiast first and a businessman second, Thorsten spent many years experimenting with the TDA chips in order to prise the last ounce of performance from them, whilst simultaneously sharing his findings and acquired knowledge with anyone who shared his enthusiasm via various online forums. 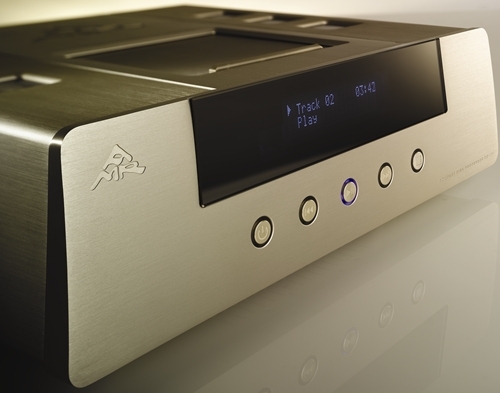 Bearing this in mind, the CD-77 should perhaps not be regarded as the first CD player designed by Thorsten Loesch, as it is a culmination of extensive testing, evaluation and adjustment over a very long period of time, resulting in the best implementation of the TDA1541 chip possible at a realistic price, by someone whose expertise in implementing the chip is second to none. Combined with this, Thorsten was also able to pick the brains of an old Philips engineer who disclosed what can only be described as a previously hidden ‘cheat’ in the TDA1541 circuit which could be utilized to further improve the chip’s performance. All in all then, plenty for a geeky TDA1541 admirer, such as myself, to be very optimistic about, so what do you get for your money and more importantly, what does it sound like? Let’s put it this way: Before receiving the CD-77, I’d obviously read the spec at the AMR website and regarded it as the one CD player I knew of which included virtually every technology I’d have requested in my ’ultimate’ digital source component, combining the Philips TDA1541A chip with a genuine valve output, double C-core transformers, bypassable digital (and analogue) filters all in a solid, well machined chassis with audiophile grade components. In fact, Christmas seemed to have come early when I learned of this player and expectations were high. A meeting was arranged to meet up with AMR’s head of marketing, Vincent Luke, in a pub car park where the aluminium flight case containing the CD-77 was transferred from the boot of his car into the back of my work’s van – a very shady-looking transaction to the uninitiated and it was with some relief that I was still able to drive home without being pulled over by the local drugs squad. Shelf space was quickly made for the new arrival. Well, first impressions were very promising. On opening the lid of the flight case the player looked ‘the business’ in its champagne finish and exudes quality, the sense of quality being reinforced by the neatly laid-out remote, AMR interconnects, AMR power cord, CD puck/clamp and demonstration CDs all held in place within their own foam cut-outs. The player itself is a top-loading design to accommodate the best transport mechanism AMR could acquire short of the wallet busting TEAC VRDS-NEO, although they also add Philips parts to the stock Sony mechanism to make it more suitable for the player. On either side of the top-loading lid, there are three cooling vents ‘windows‘, and these also allow light to be emitted when the player is in standby or fully powered up to give an attractive glow from the ubiquitous blue LEDs. Remember when LEDs on audio equipment were red, anyone? On the front of the player, we have just five touch-sensitive buttons in a row, giving the CD-77 a perfectly symmetrical appearance which I suppose is appropriate given the dual mono layout inside the player. On the rear of the player, we have both balanced and RCA outputs, along with a USB digital input for connection to a PC or any other USB output equipped device. Removing the 28kg CD-77 and placing it on the rack isn’t the easiest of tasks, but not the hardest either, and certainly more manageable than most amps, although once you place the CD-77 on your rack I’d wager that it might just stay there for quite some time; so lifting it won’t be a problem. Now, it was a case of removing the foam insert from beneath the sliding lid which held the sprung transport in place, inserting a CD and hoping that all the anticipation hadn’t raised my expectations to a level that the CD-77 couldn’t possibly live up to. To make things even more of a challenge for the CD-77, the bar had already been set high for digital replay as my current reference was one of the previously mentioned Marantz CD7s, only not just any old CD7. Breathed on by Trichords Digital Guru Graham Fowler, Ken Ishiwata’s baby had been significantly up-graded to a spec which includes Trichord IVb clock, ‘Never Connected’ power supply unit, high-performance 5v regulator boards, fast recovery diodes, Oscon caps, Bybee filters, ERS emf screening, SST contact enhancer and other tweaks which, according to the previous owner, brought improvements in every area without changing the sonic character. Not having heard the CD7 in it’s original condition, I couldn’t comment on the effect of the mods, but suffice to say the player as it stood was supremely natural and (sigh….) analogue; in fact, the CD7 had everything you would want in a digital source and the thought of upgrading this ultimate implementation of the Philips TDA1451 was never an issue – until I learned of the CD-77 which in particular added the valve output I thought would improve over the Marantz HDAMs whilst removing that nasty old digital brick wall filter. The system in place for the following listening impressions comprised the Audio Note AN/E Spe HE speakers, Border Patrol SET power amp and Audio Note M3 pre, then when the AMR AM-77 amp arrived midway through the review this was used with Dynaudio Contour 1.3mkIIs. Kimber Select cabling was used throughout. Once the 45-second ‘warm up’ countdown had elapsed, first CD to be clamped beneath the CD-77’s magnetic puck was a CD-R of Newton Falkner’s Handbuilt By Robots (RAC) which had been getting a lot of play in the Redmond household lately; but before I had a chance to sit down I was given a start as the disc began to play automatically. I’ve since discovered it is possible to disable this particular feature by pressing STOP on the player’s facia and PLAY/PAUSE on the remote simultaneously. If this was a bit of a shock however, sitting down and skipping forward to track 5 “Dream Catch Me” caused my eyebrows to raise so much they were almost singed on the room’s light bulb, as the grossly overplayed intro to my favourite track demonstrated a more layered, complex quality than previously heard via the CD7. The ’shoot out’ was over before it had even begun, and my mind instantly conjured forth the scene from Raiders of the Lost Ark where the whip-cracking Indiana Jones is faced by the sword-wielding Arab and a battle royal is anticipated, only for Jones to casually pull out his pistol and end the confrontation before either had so much as broken sweat. To be honest, this was a blessing in disguise as when differences in components are subtle it can be mind-numbing, swapping from one to the other trying to distinguish just what those differences are, and more specifically it can be a frustrating procedure putting these subjective interpretations into print for your good selves to mull over, if those differences are improvements or merely sideways steps. Problem solved then – the valve output, filterless (analogue and digital) CD-77 is clearly better than the modified CD7, which in itself was the best implementation of the Philips TDA1541 double crown using solid-state output and conventional filters I’ve heard and probably the best solid-state output digital source I’ve heard, period. What follows is an account of the CD-77’s prowess once my reviewer’s hat is firmly atop a head nodding in time with and in appreciation of the music, whereas without the hat it would be a simple case of writing ’Wow!’ I think I’m right in suggesting that most of us are after a source which is non-fatiguing yet highly resolving, but I also think I’d be right to suggest that most of us find components to be balanced one way or the other, and to a large extent, it’s this balance which gives a certain ’house’ sound to the different manufacturers. Lower priced components obviously don’t have the parts quality or power supplies to give SOTA resolution and will typically be used in similar priced systems. Still, a well balanced component in a well balanced system can be very enjoyable to listen to, but as we move up the price range it should become MORE enjoyable IF the balance is successfully maintained. For me the CD-77 is the embodiment of perfect balance with a sound quality I find near impossible to fault. The highs are extended, the mids are beautifully open and natural. Of particular note is the bass which could be the deal clincher to anyone who compares this player to other similarly priced players. Both exceptionally deep and detailed, I’d recommend that anyone who has reservations about the bass on valve output players should be locked in a room with the CD-77 for 24 hours with a copy of Martyn Bennett’s Hardland on repeat; if they survived the experience their reservations would be removed completely. It’s a cliché for sure, but I’m hearing new aspects and details in CDs I’ve owned for years. Where once there was one vocal there is now a barely perceptible second to assist on certain hard-to-reach notes, and where once one or two of four vocalists were taking their turn centre stage, now all are contributing albeit at such a level that they simply flesh out the main vocals. Similarly, the CD-77 is also gifted when it comes to instrumental separation and definition. A case in point is the classic “Songbird” from Fleetwood Mac’s Rumours album, which I’m sure most of us having lying around somewhere? While four studios were involved in recording tracks for Rumours, “Songbird” is the exception in that it was recorded at the cavernous Zellerback Auditorium, U.C. Berkeley. The combination of Christine McVie’s beautiful song writing, delicate piano playing, understated vocals and the Zellerback’s acoustics created a classic recording which perfectly demonstrates what music enthusiasts mean when they describe how it is possible to feel the ‘emotion’ of performers on the best systems, and I’ve heard this track numerous times over the years without ever becoming jaded. What I’m suddenly finding a little troubling however is that it’s only since playing this track recently on the CD-77 that I’ve noticed the acoustic guitar which accompanies McVie’s piano, even though it is so obvious I’m sure I must have been hearing it on other players, through other systems. What is even more puzzling is that after a comprehensive ’Google’ of “Songbird” recording and various other connotations, my own previous belief that Ms. McVie recorded the track in one continuous take, alone with just the piano for accompaniment, was reinforced with no mention of any other musician (Lindsey Buckingham would be favourite) whatsoever. To get ‘back on message’ however, the point is that I’m confident anyone reading this, who has a decent system and a copy of Rumours will have very little difficulty hearing the guitar, but I wonder how many actually noticed it before? An analogy I’ve used previously is that you can compare a black & white photograph with a colour photograph of equal resolution, but there will be things in the colour photograph – such as a small red ball in the grass – that you didn’t notice in the monochrome version. Of course, look again at the black & white photo and there the ball is. In audio we don’t generally have such ‘black and white’ comparisons, and with the CD-77 it’s more a case of its superior palette being better at revealing a small orange ball in a field of red grass without highlighting it unnaturally. By now you get the picture(s), the CD-77 gets you closer to the live performance than we were led to believe digital, and certainly not 16 bits, was ever capable of. 2. Digital Master II (default) – this mode is identical to Digital Master I but complements this with a special analogue filter which corrects the roll-off in the treble frequencies. As a result, the tonality is more accurate in the treble. We therefore recommend this mode as the benchmark with which to enjoy music. 3. Oversampling 2x – this mode engages the Digital Filter with an oversampling factor of 2, thus performing the least digital processing possible (except for no digital processing). The original data from the CD is in effect discarded and re-placed with a re-computed version. This new version of the music is mainly linearly scaled up using a whole number as scaling factor and resolution/edge enhanced. The sonic result of oversampling mirrors those of resolution enhancement in digital photographs: more apparent detail is noticeable. However, impulse reproduction is slightly distorted, leading often to a slight perception of an edginess or graininess. During the review period which has been quite extensive now, I’ve flicked through each option and the differences are so subtle to my ears that I wouldn’t bet the price of a drink on being able to distinguish between one or the other blind, and because I’ve read what effect each option should have, this effects my judgement when doing the comparisons sighted, such is the power of suggestion. Fortunately, as already mentioned the differences between AMR CD-77 and the Marantz CD-7 weren’t quite so subtle, and in due course the AMR performed the old cuckoo chick act of spreading it’s wings and unceremoniously displacing the previous occupant of the nest to the ground below – or in this case to the audio equipment classifieds where it was snapped up very quickly. For me the CD-77 is everything I could reasonably have hoped for in a CD player with a performance that exceeded already high expectations. Build quality is excellent, sound quality is excellent and the price is excellent – not exactly the most inspired writing but sometimes it’s more effective just to call a spade a spade; I bought a CD-77 myself, I’m not one to be impressed by claims or new technologies but this player is old school meets new and something special – anything which manages to prise a significant amount of hard earned cash from my clammy fingers has to be special nowadays, but if you think this review is, shall we say, quite complimentary, read on. After completing this review a couple of months ago, along with an unwelcome price increase due to the devalued UK pound, a whole raft of upgrades have been applied across the AMR product range (77 to 77.1) to compensate. The AM-77 has benefited most, but the CD-77 has also had it’s performance ramped up even further, and guess who’s sitting here now with a big grin on his face penning a review of the new spec system? It’s worth mentioning a new range of AMR components about to be introduced at CES in January 2009. Sharing much of the technology of the flagship 77 series, in fact make that the 77.1 series, the 777 series should retail for around 3000 Euro each, which will put them within reach of considerably more pockets. Catch the next issue of Dagogo then for the first review of a full AMR 77.1 System including the new AMR LS-77 stand-mount monitor, affectionately know as ’baby Rhinos’ at AMR headquarters – once you’ve lifted them up you know why.